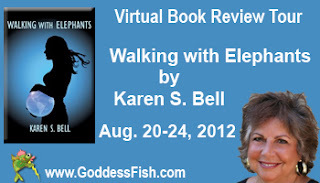 Goddess Fish Promotions is organizing a Virtual REVIEW ONLY Tour for "Walking With Elephants" by Karen S. Bell, a 197 page contemporary humorous Women's Fiction novel available now. 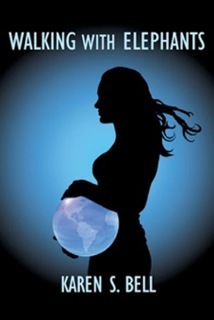 The tour will run August 20 - 24, 2012 and the book is available in PDF format. Karen will be awarding a digital copy of "Walking With Elephants" to a randomly drawn commenter during the tour. Bridget Jones meets Erma Bombeck. Walking with Elephants, a lighthearted slice-of- life story, brings to the table the serious work/family issues facing women today. It explores the modern dichotomy of a workplace that is filled with homemakers who still must cook, clean, carpool on nights and weekends, shop for prom dresses, and "create" the holidays—such as Suze. But it also is filled with women who have the same drive as men, have no family responsibilities, and will do what ever it takes to get ahead. I can host a stop on August 21st. Crazy Four Books can post a review on the 20th. Thank you! I would love to review on the 23rd!